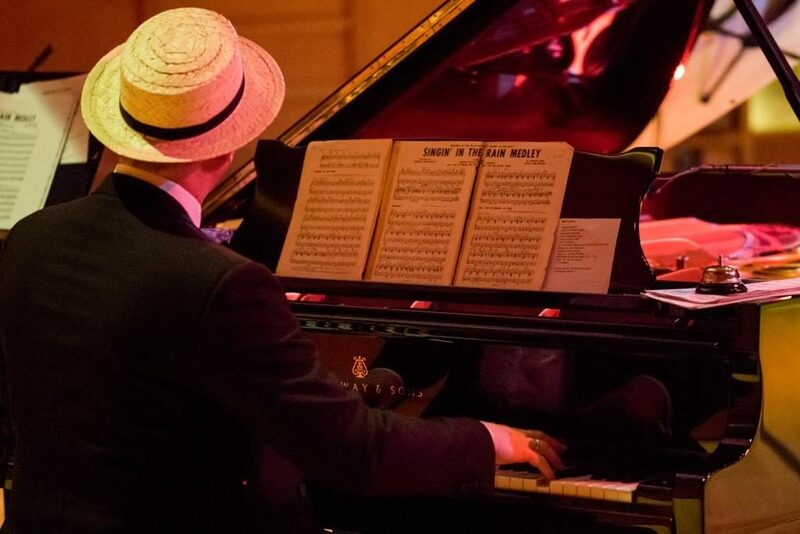 General Harding’s Tomfoolery | Music Matters | Because it does. Doesn't it ? One of the marvellous aspects to the sheet music archive the Music department was bequeathed by the Ken Lewis Dance Orchestra is the peripheral documents occasionally to be found lurking amidst all the music. 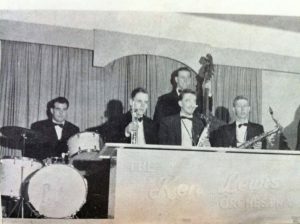 As regular readers will know, the Ken Lewis Dance Orchestra was a dance band active throughout the county during the 1950s and 60s, run by George Morgan, from Gravesend. 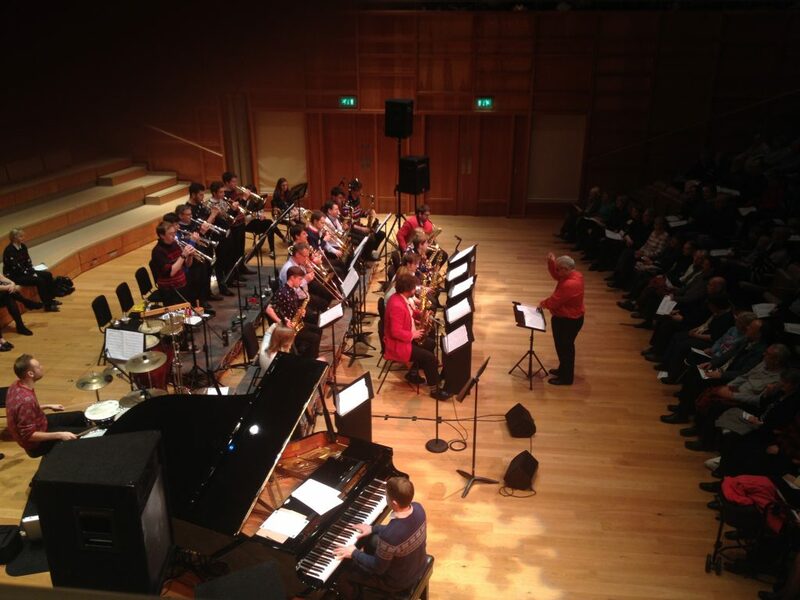 The band played throughout the region, including playing as the warm-up band for the Ted Heath Orchestra in at Chatham Town Hall. In 2005, George and his wife Maureen (the latter Chief Manager of the band’s sheet music!) 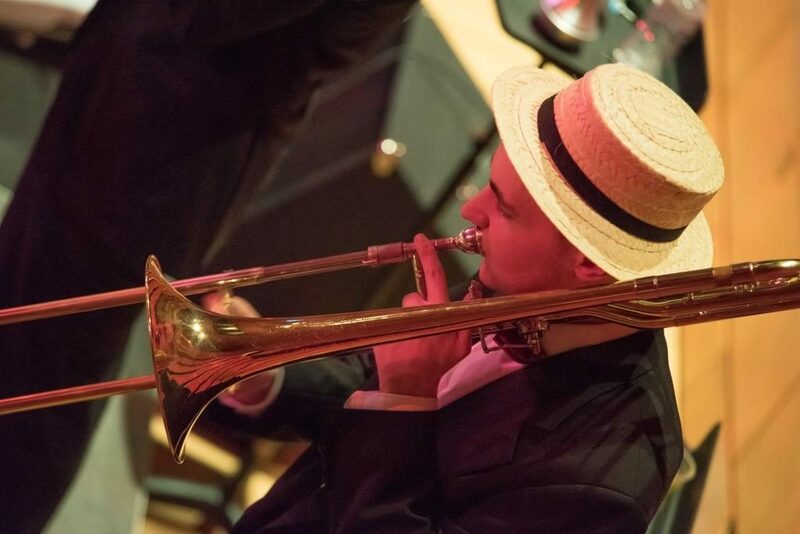 generously donated the entire archive of band music to the department, and in 2013, the Deputy Director of Music, Dan Harding, put together a group of student players to bring the music to life once more as General Harding’s Tomfoolery. The band danced its way through that academic year, and formed once more in 2016-17. 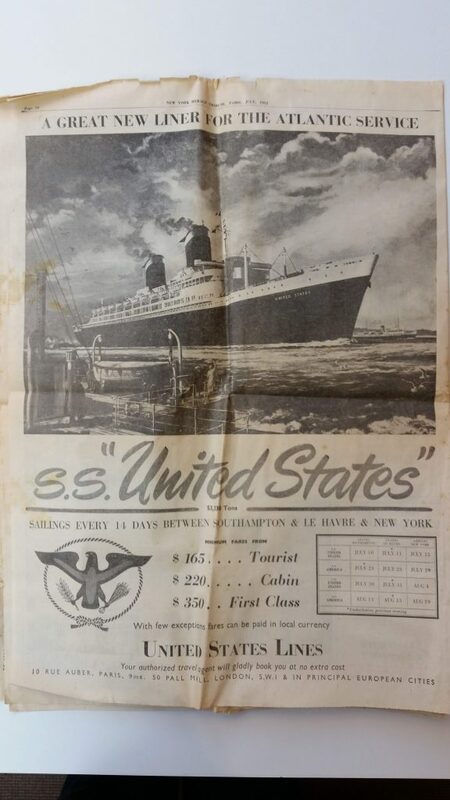 Going through the archive, this morning’s find is a copy of a special section of the Herald Tribune, published in Paris in July, 1952, commemorating the maiden voyage of the SS United States from America to Europe, when it was to dock at Southampton. 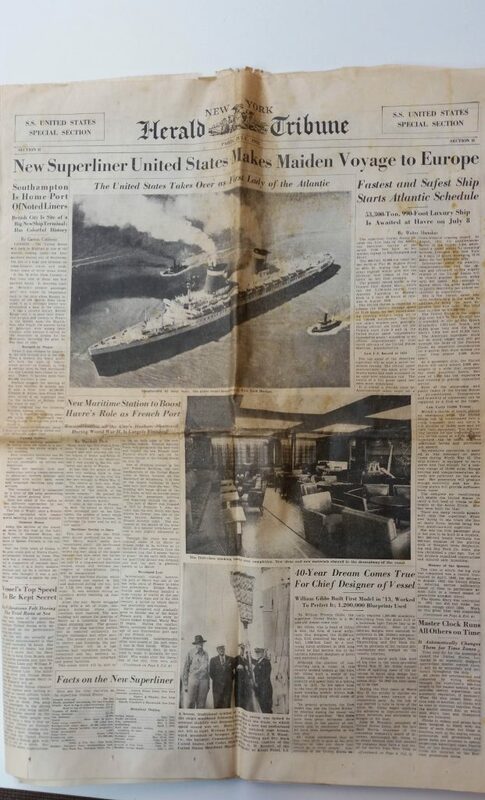 The ship weighed in at 53,000 tonnes and measured 990 feet, and was making its way to Le Havre, where it was to dock later that month. 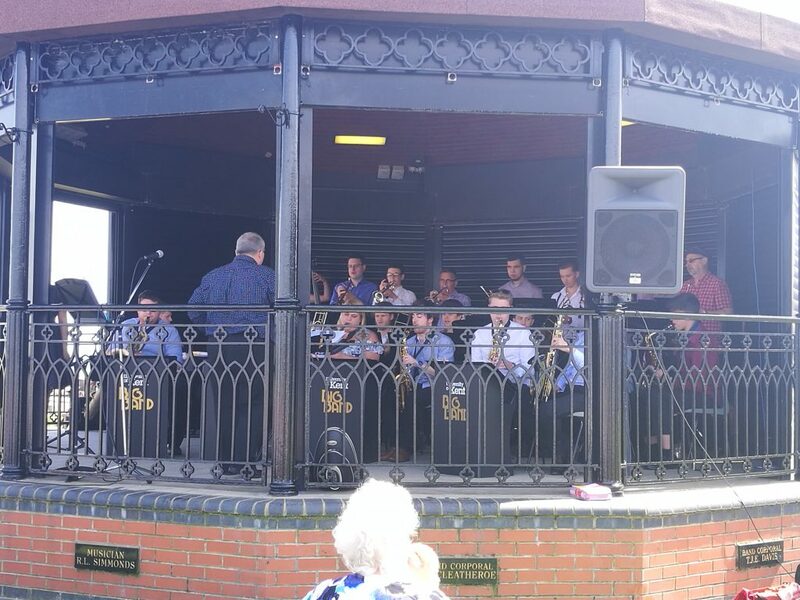 Our annual Summer Music Week festival launched in fine style over the weekend, as the Big Band headed to the seaside to perform on the Memorial Bandstand at Deal. 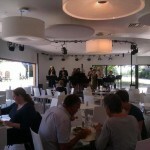 Big Band at the Beach! 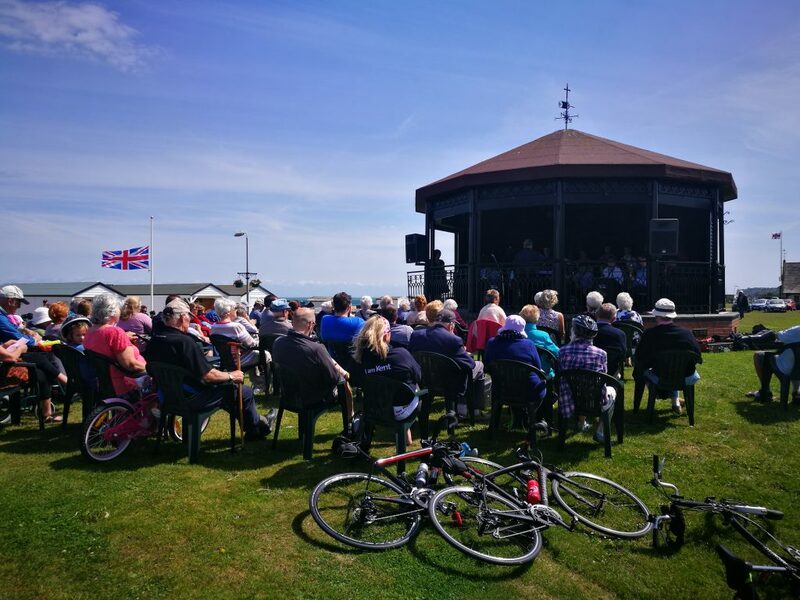 Blue skies, clear weather and a great crowd greeted the players under the baton of Ian Swatman, with audience scattered on the greensward around the bandstand in deck-chairs and sun-hats. 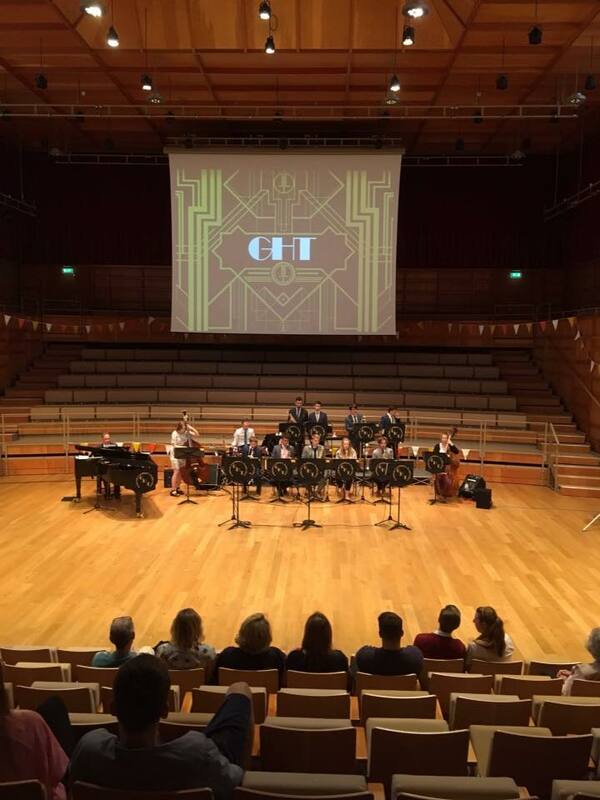 Day Two yesterday carried on the jazz theme, as General Harding’s Tomfoolery filled Colyer-Fergusson Hall with swing music from the 30s, 40s and 50s in Five O’Clock Stomp. 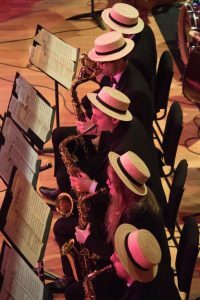 The thirteen-piece dance orchestra were joined by The Minervettes, and unveiled an energy-filled programme of popular favourites including The Charleston, Puttin’ On The Ritz and classic Glenn Miller tunes. 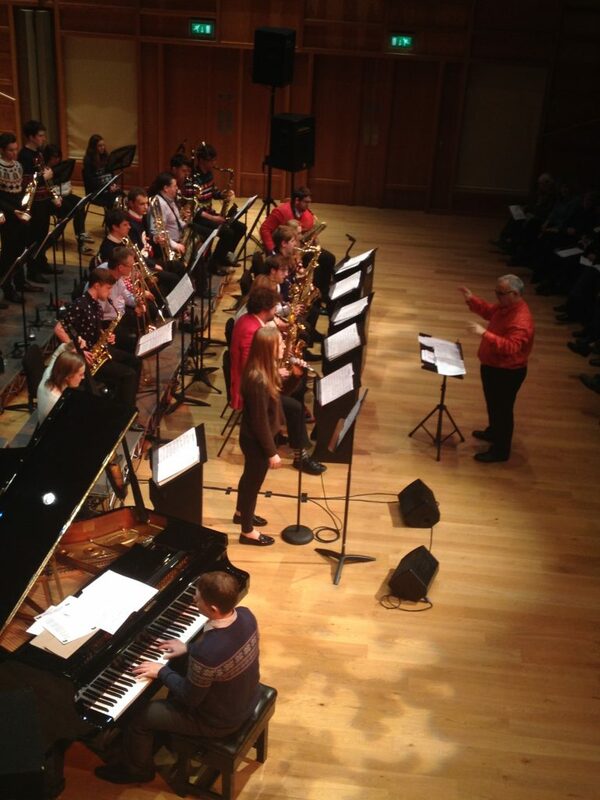 Today, Day Three, sees a Lunchtime Recital by University Music Scholars in music by Piazzolla, Joseph Horovitz and Sonny Rollins at 1.10pm, followed by the presentation of the annual Music Prizes. 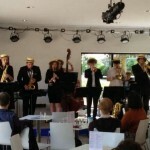 Summer Music Week continues until Saturday; details here. 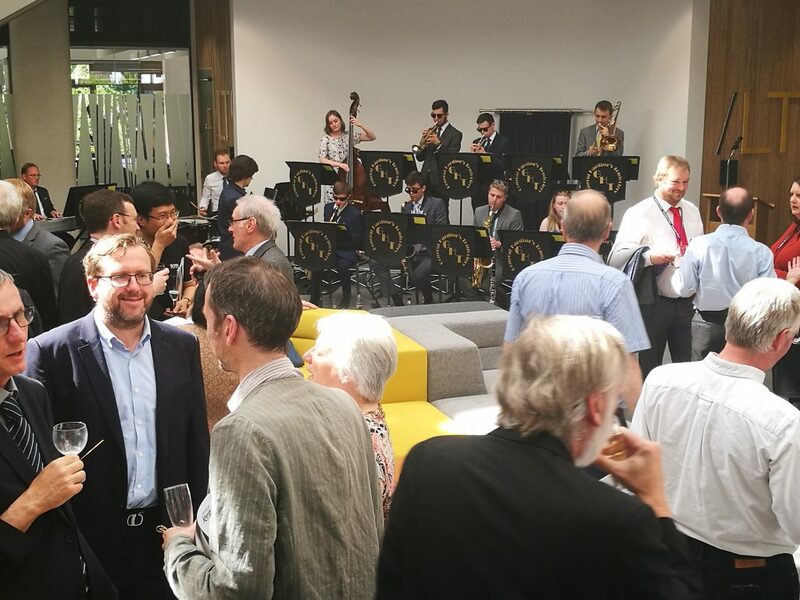 Yesterday afternoon saw the launch of the Sibson Building, the University’s newest addition to the Canterbury campus, and the joint new home shared by Kent Business School and the School of Maths and Actuarial Sciences. 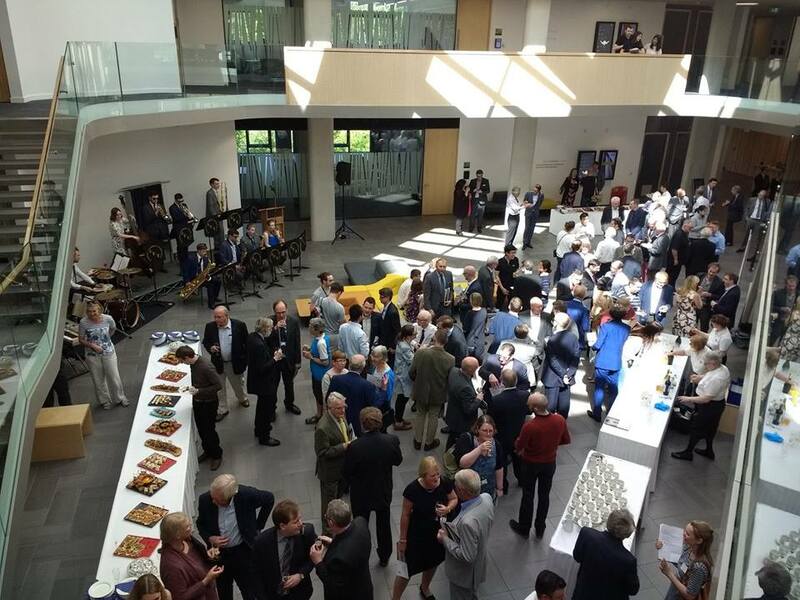 The musicians of General Harding’s Tomfoolery were in action for the second time in less than a week, entertaining the guests at the reception held before the unveiling of the plaque formally to open the new facility. 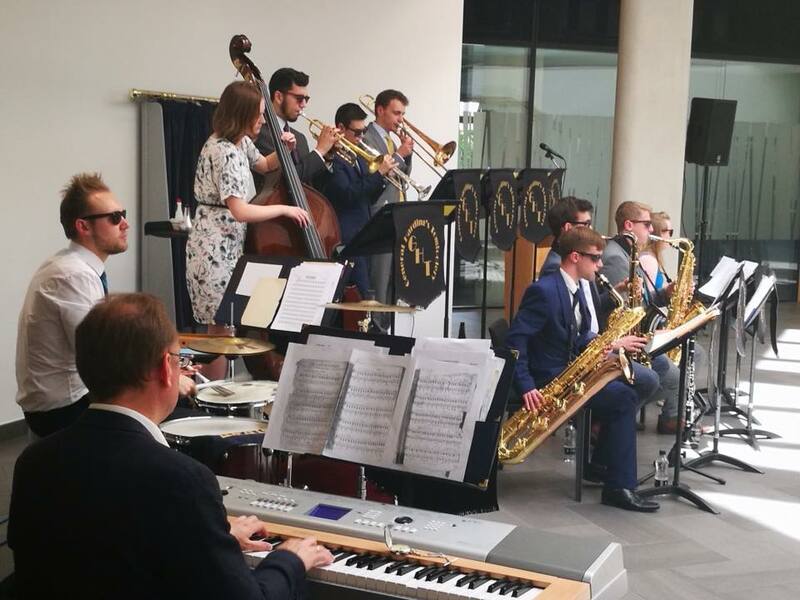 A great afternoon for everyone involved; the players particularly enjoyed themselves, channeling their inner Blues Brothers whilst playing some vintage jazz for the assembled guests. 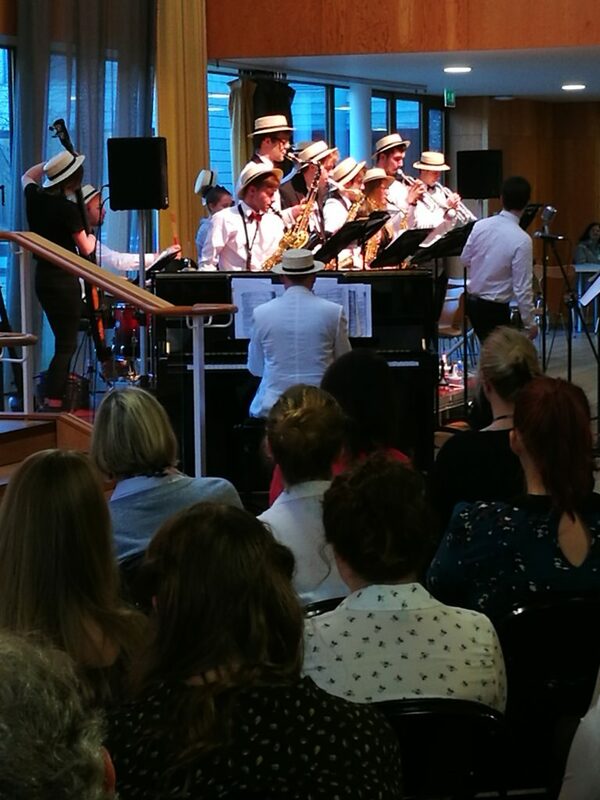 Tomfoolery will be back in action on Monday 5 June in Five O’Clock Stomp in Colyer-Fergusson Hall as part of Summer Music Week; admission is free, details here. 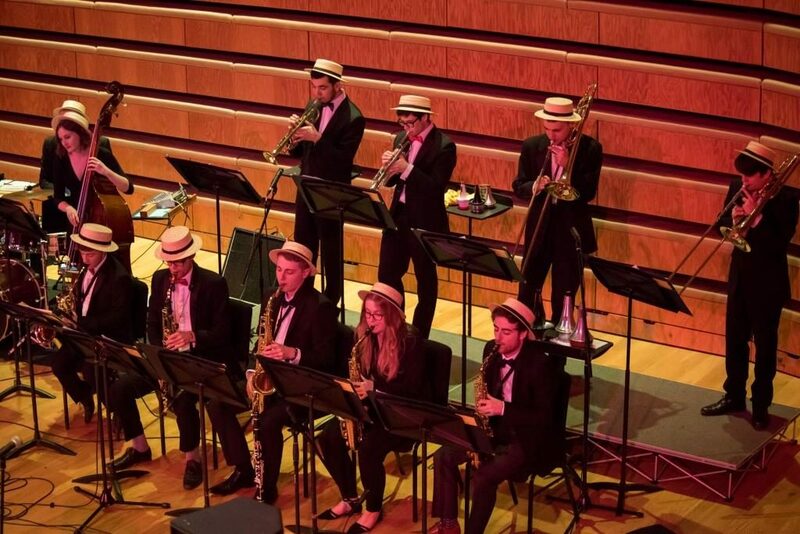 Fresh from the success of its lunchtime concert last term which had people on their feet dancing in Colyer-Fergusson Hall, General Harding’s Tomfoolery, the vintage jazz orchestra, is back in action next Friday night. 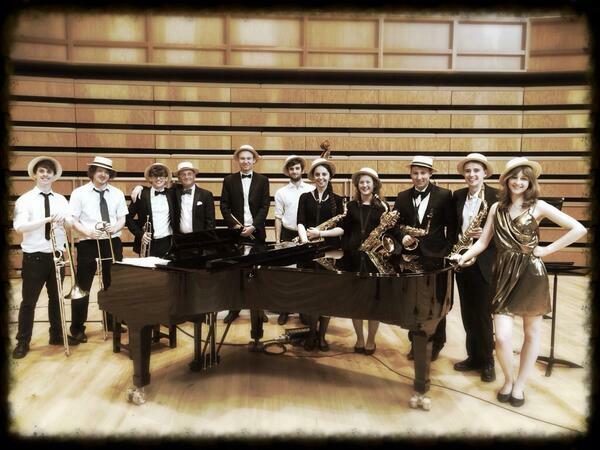 The 1930’s style dance band will unveil a whole new repertoire on Friday 19 May, as well as favourites from its previous gigs; together with the close-harmony singers, The Minervettes, the players will unveil an evening of vintage swing classics alongside forgotten gems from the Golden Age of Dance Bands in Moonlight Serenade: an evening with GHT. Tickets are only £5 a pop for what promises to be an energetic trip to a bygone era – dancing-shoes are essential, cloche hats optional! Find out more here. 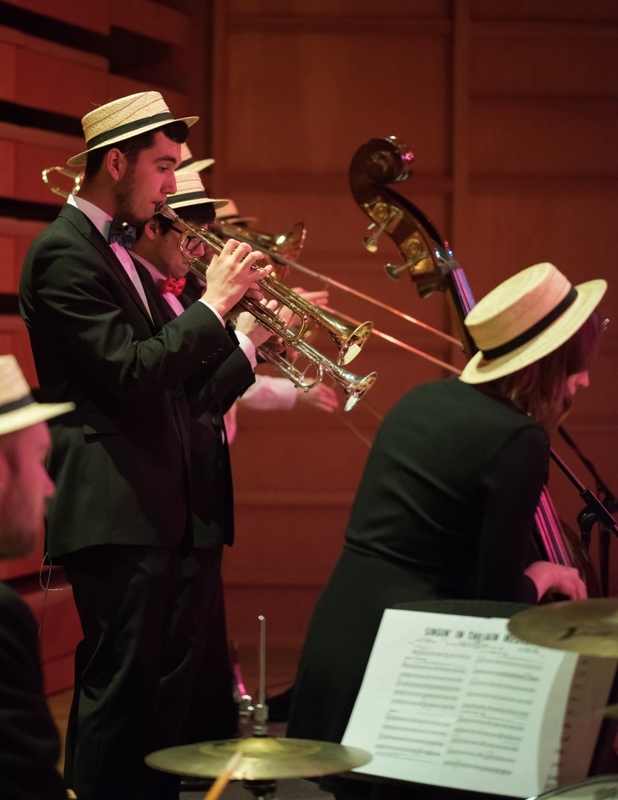 (Straw) hats off to the member of General Harding’s Tomfoolery and the Minervettes, for their recent, storming lunchtime concert in Colyer-Fergusson Hall. 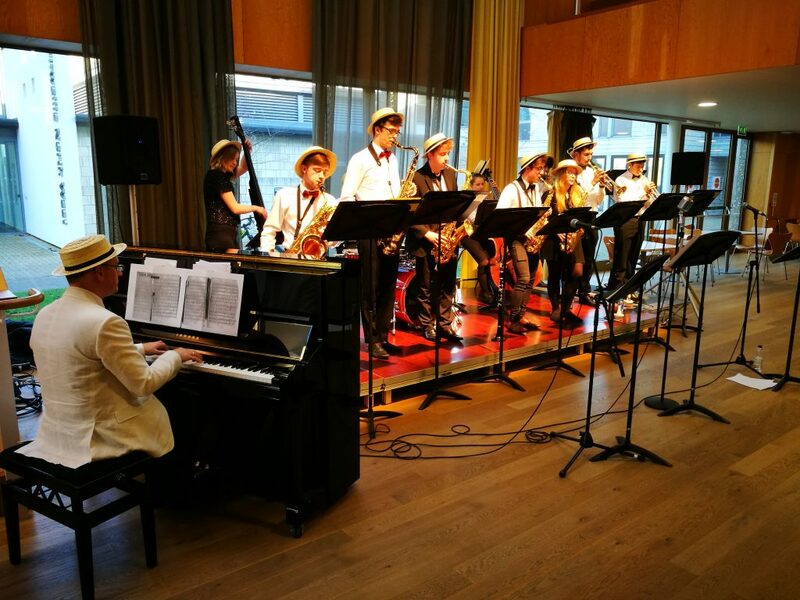 The thirteen-piece dance orchestra, performing from original sheet-music from the 1930s, 40s and 50s delivered an energetic performance that had people dancing along. 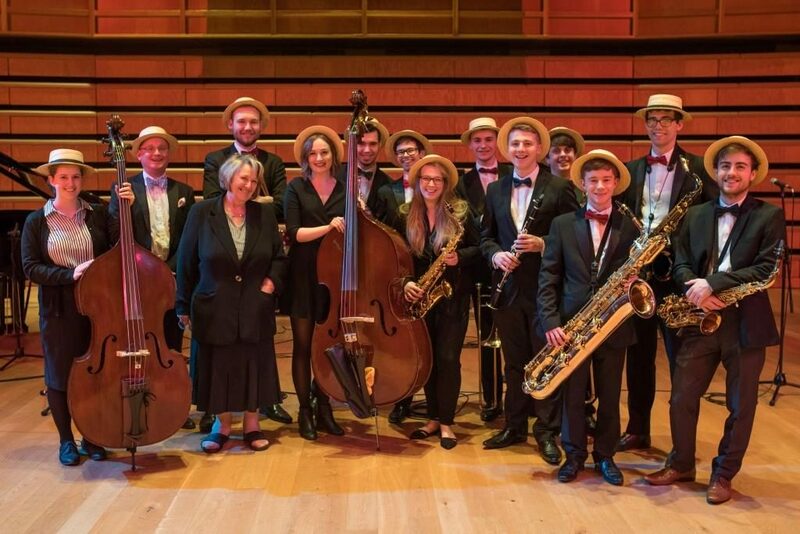 We were particularly delighted to welcome to the gig Maureen Morgan, wife of bandleader and founder of the Ken Lewis Dance Orchestra, George Morgan, whose generous bequest of all the sheet music from the original dance orchestra allows us to breath new life into the original band-parts. 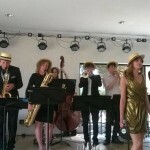 Tomfoolery will be back in action on Friday 19 May in an evening performance; bring your dancing-shoes! 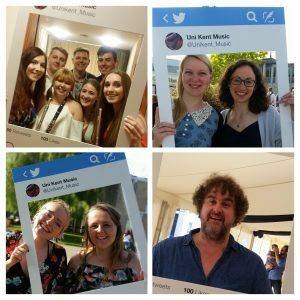 It’s been a busy week here in the Music department, with the final musical events bringing the term to a rousing seasonal finale. 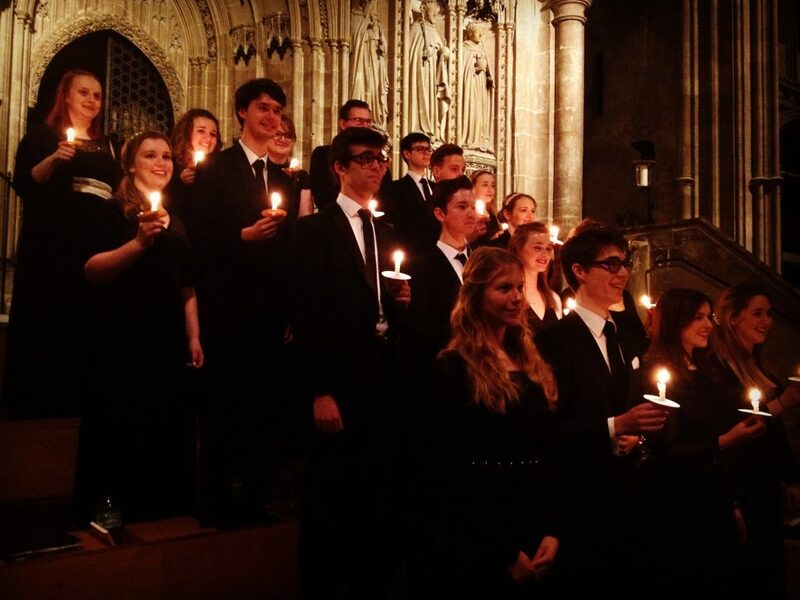 On Tuesday, the Chamber Choir, conducted by Your Loyal Correspondent, performed as part of the University Carol Service in Canterbury Cathedral – always a magical occasion, which starts with the entire Cathedral being plunged into darkness, and the notes of the choir’s first carol rising to the dark recesses of vaulted roof above a sea of candles. 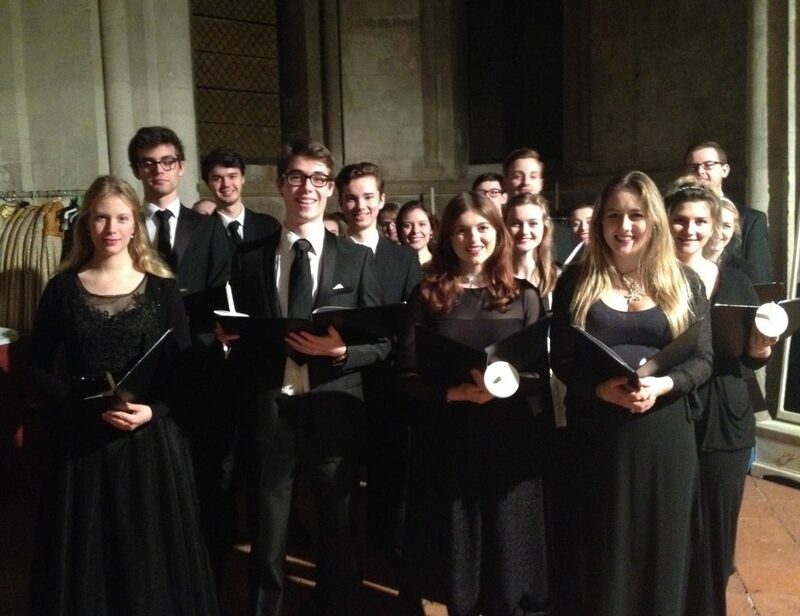 Second-year Doug Haycock made his conducting debut with Tavener’s The Lamb, opening the service in evocative fashion. 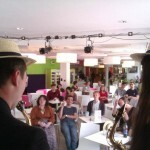 Wednesday afternoon saw General Harding’s Tomfoolery, the vintage dance-band, taking to the foyer-stage in a spirited selection of swing classics, for which they were joined by The Minervettes; trombonist and singer, post-grad Rob Cliff was a smooth host, and both band and singers were in fine form in pieces including American Patrol, Puttin’ On The Ritz and Sleigh Ride. 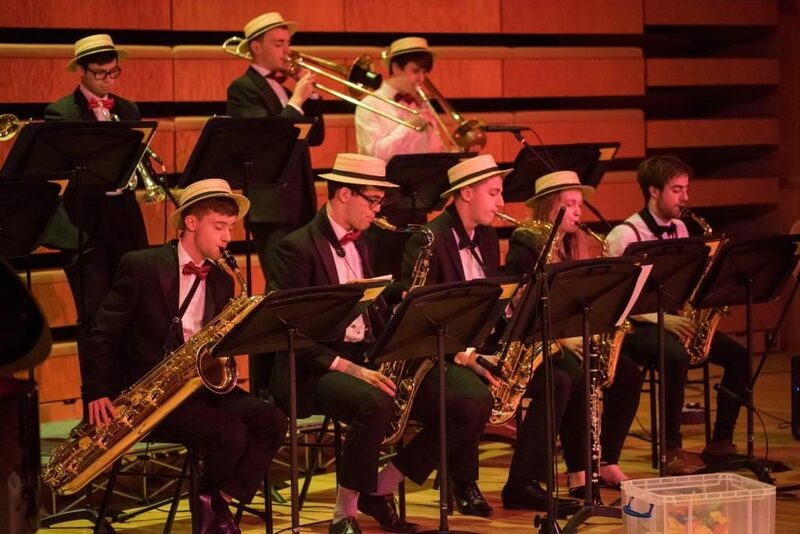 The final event in this term’s musical calendar was yesterday evening’s ebullient Christmas Swingalong with the Big Band, directed by Ian Swatman, which saw first-years Dottie Grenville and Alicia O’Malley making their singing debut with the band. Feisty incarnations of familiar pieces including A Chilli Pepper Christmas, audience carols with the brass ensemble and the traditional, inimitable rendition of Santa, Baby by our very own Sophie Meikle culminated in a sing-along I Wish It Could Be Christmas Every Day, before audience and performers alike spilled out into the foyer for mulled wine and mince pies. 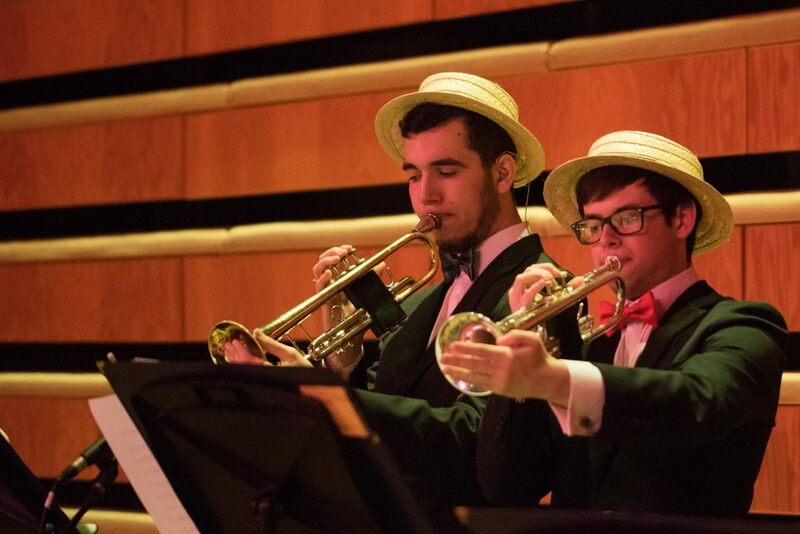 It’s been a terrific term, full of music-making; thanks to both everyone who has performed throughout the term, as well as to those who have been amongst the audiences. 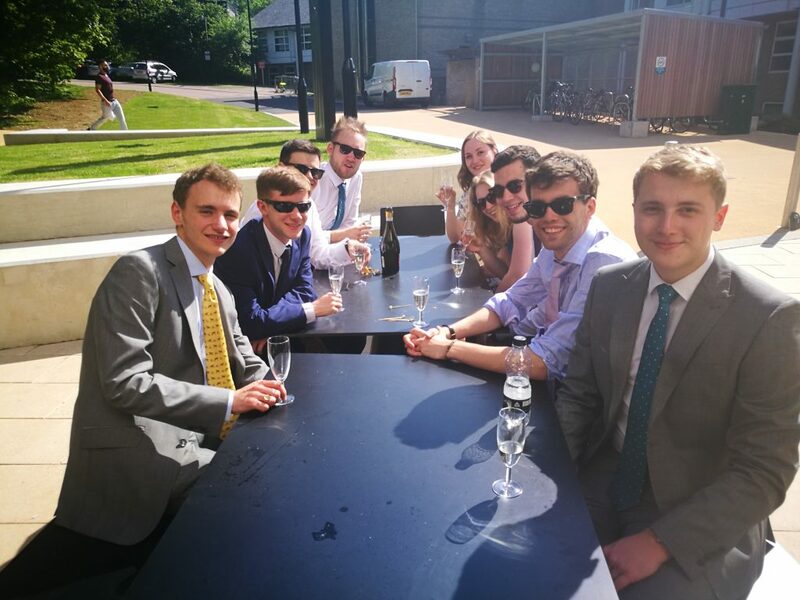 We’ll be back in the New Year with full details of our spring / summer season; from all the Music team here, we wish you all a happy and peaceful Christmas! 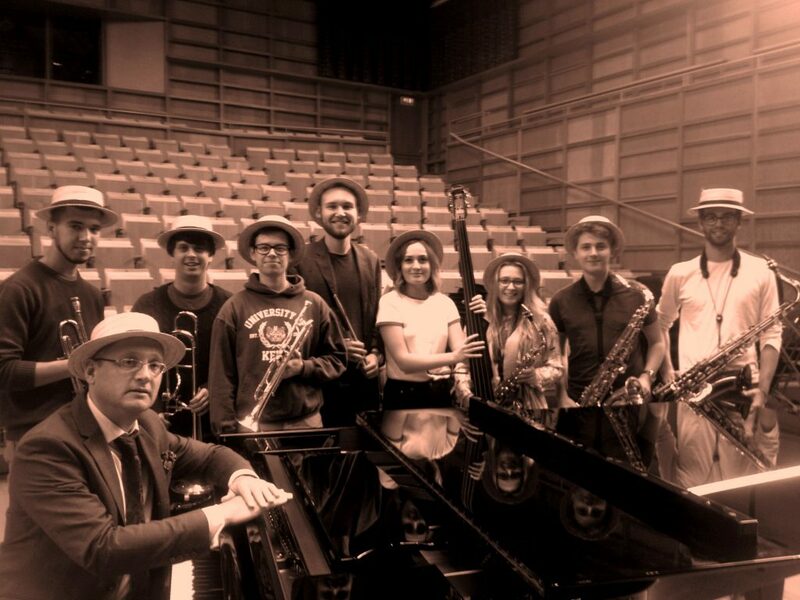 Cometh the hour, cometh the jazz musicians: the stars have aligned, and this year the twelve-piece dance band, General Harding’s Tomfoolery, is back in action. 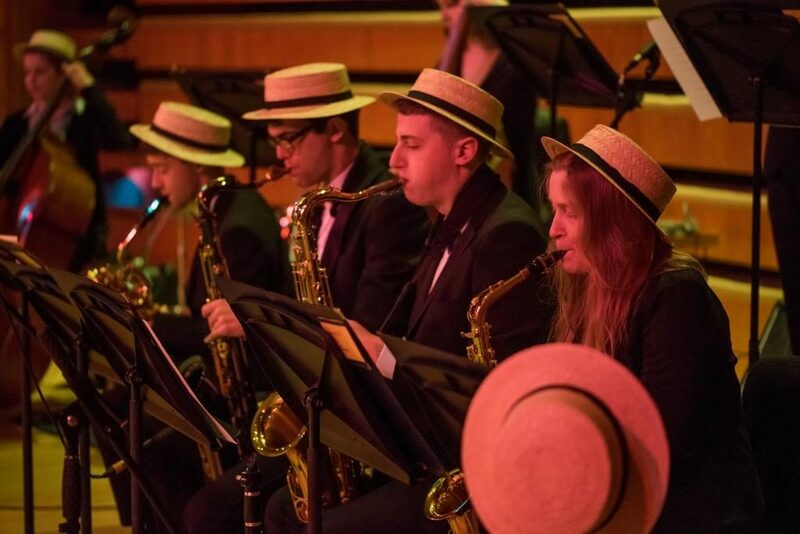 The group was originally formed in 2013 to breathe new life into a set of dance-band music originally bequeathed to the Music department by the Ken Lewis Dance Orchestra. 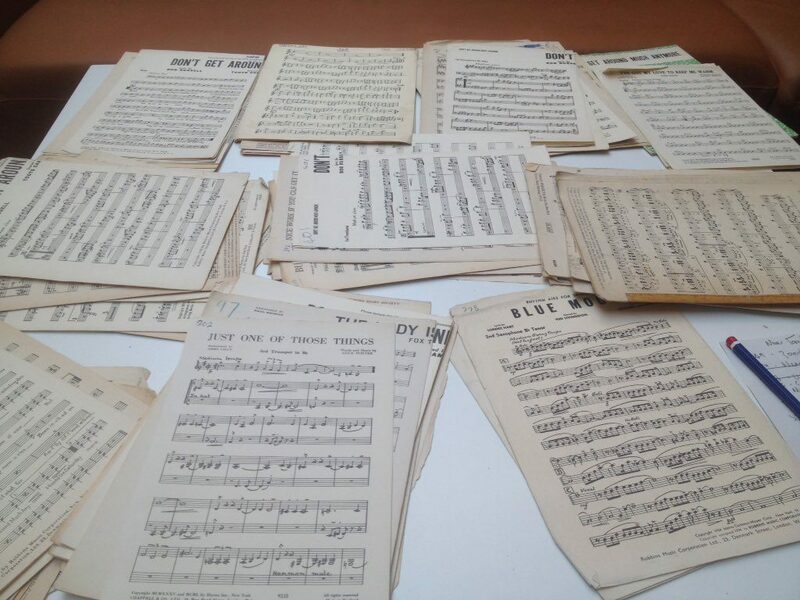 The original folders of music contain vintage original copies of pieces from the 1930s through to the 1950s, including swing classics such as Tuxedo Junction and American Patrol, brittle with age and with faded Sellotape sometimes holding the fragile pages together. 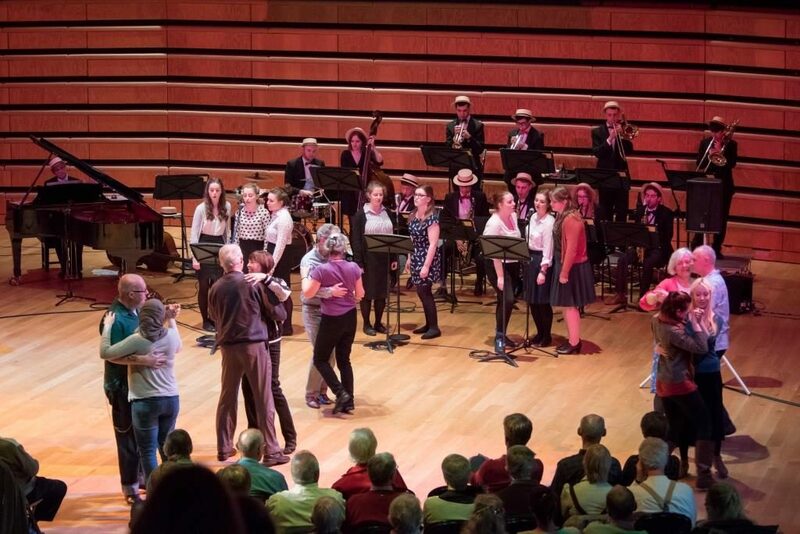 The group gigged throughout the year, including a memorable afternoon which had Colyer-Fergusson Hall filled with people dancing along. 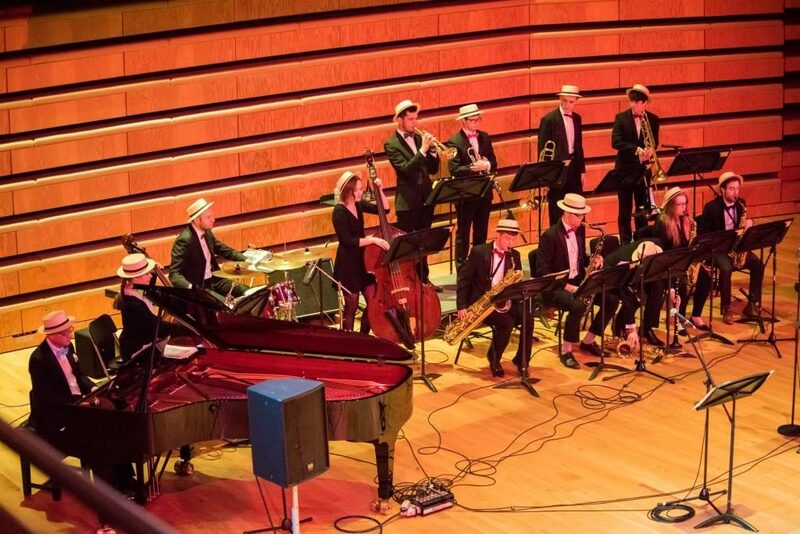 Bring your dancing-shoes on Weds 14 December at 1.10pm, when Tomfoolery will play a festively swinging set to get people In The Mood for the Big Band’s seasonal favourite, the Christmas Swing-along, at 5.15pm later in the day. More details here. 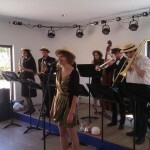 Our usual bass-player was away that day – a tip o’ the straw hat to Jenn Morgan who stepped up to play, and performed as though she’d been a part of the band for ages. 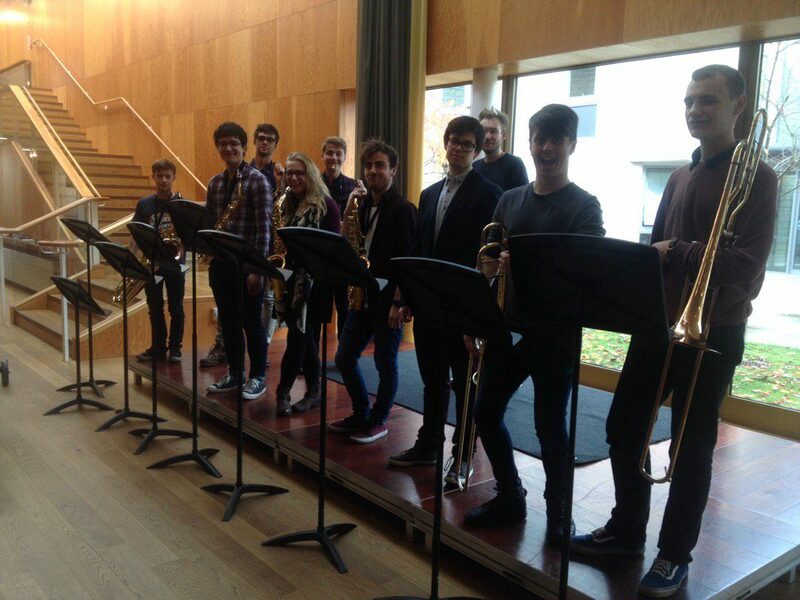 Thanks to the Gulbenkian for hosting us, and to everyone who has been a part of the group this year.